(Phys.org) —Results from a research project involving scientists from the Desert Research Institute have generated new findings surrounding some of the unknowns of changes in climate and the degree to which ecosystems absorb or release carbon dioxide as it increases in the atmosphere. The latest research findings were published this month in the journal Nature Climate Change. The publication details how over a 10-year span researchers exposed arid desert plots to elevated carbon-dioxide levels similar to those expected in 2050. The research was done in at the Nevada Desert F.A.C.E (Free-Air CO2 Enrichment) Facility (NDFF), located in the Mojave Desert north of Las Vegas. The study, which included lead author R. Dave Evans, a professor of biological sciences at Washington State University, originated with scientists from three institutions of the Nevada System of Higher Education: the Desert Research Institute, the University of Nevada Las Vegas; and the University of Nevada Reno. Researchers from the University of Idaho, Northern Arizona University, Arizona State University and Colorado State University also contributed. "Researchers from across the country participated in efforts to better understand arid ecosystem response to elevated carbon dioxide," said Lynn Fenstermaker, Ph.D., DRI associate research professor and Director of the NDFF. "DRI was pleased to be a member of this multi-institutional, interdisciplinary team working at the Nevada Desert FACE Facility." 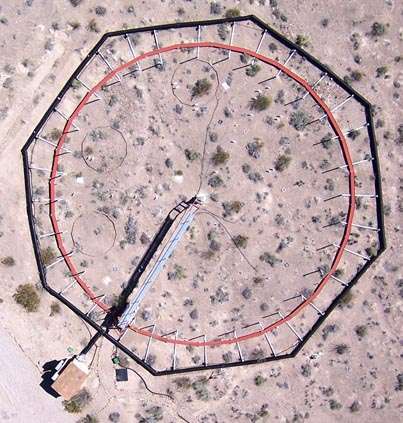 "An exciting tool used at this facility was a radio control helicopter and multispectral camera to help quantify vegetation cover and the final size of the area harvested when the carbon dioxide was turned off," added Dr. Fenstermaker. The new findings indicate how arid climates take up significant amounts of carbon as levels of carbon dioxide increase in the atmosphere. These findings provide scientists with a better gauge of the global carbon budget—which measures the rising concentration of greenhouse gases such as carbon dioxide (C02) in the atmosphere. The results from this project echo similar findings published in 2008 by Dr. Fenstermaker and her colleagues (Wohlfahrt et al., Global Change Biology, 2008) regarding CO2 uptake by Mojave Desert ecosystems and another research paper published by former DRI associate research professor Dr. Paul Verburg (Verburg et al., Plant Soil, 2014). 32 years of science's 95% certainty is why it's called; "BELIEF"
The deniers have won so let's see you remaining "believers" start acting like we are doomed now without your needed; "climate action" to SAVE THE PLANET.